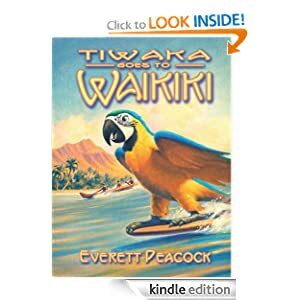 everett.peacock.com: 5 Star Review for "Tiwaka Goes to Waikiki"
5 Star Review for "Tiwaka Goes to Waikiki"
The 3rd book in the series "The Life and Times of a Hawaiian Tiki Bar" got a great write up on Amazon recently. This book and the others in the series The Parrot Talks in Chocolate: The Life and Times of a Hawaiian TIKI Bar and In the Middle of the Third Planet's Most Wonderful of Oceans: The Life and Times of a Hawaiian Tiki Bar are a magic escape from dusty midwestern summers and dreary ice bound winters. The cast of characters is well drawn, and their journey is a great allegory for life in this millenium. The songlines are all connected, and the mysticism of the islands mixes beautifully with a fresh, amusing look at humanity. The narrative is enchanting. Yes, I love it. It's fun fiction that touches the pirate child in all of us, and the longing heart that we've learned to hide. A must for fans of Jimmy Buffett.